A personal, creative and historic journey spanning three decades reached a cross roads with the recent publication and release of Spirit of the Ojibwe – Images of the Lac Courte Oreilles Elders. The thirty-two elders’ portraits created by Sara are featured in this artistic and historically significant book published by Holy Cow! Press in Duluth, MN. The original oil portraits were supported by grants from the National Endowment for the Arts, Wisconsin Arts Board grants and with additional support by the Lac Courte Oreilles Tribal Governing Board. Accompanying the portraits are biographies written by co-authors James R. Bailey and Thelma Nayquonabe, as well as historical essays, photographs, maps and an Ojibwe language glossary. The paintings, stories and photographs tell the personal stories and historical journey of the Ojibwe people in Northwestern Wisconsin. 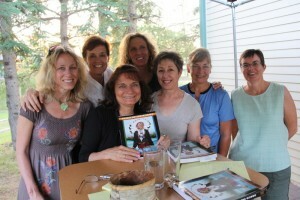 On June 28, a public reception for Spirit of the Ojibwe was hosted by Redbery Books (http://www.redberybooks.com/) with the gracious hospitality of the Rivers Eatery in the Ideal Market (http://www.theidealmarket.com/Pages/Rivers.aspx) in downtown Cable (http://www.cable4fun.com/). 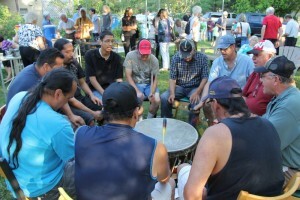 In a gathering under sunny skies the Badger Singers Big Drum from Lac Courte Oreilles (http://www.lco-nsn.gov/) welcomed a large gathering of friends with awe inspiring traditional songs. Gary Quarderer a spiritual representative from LCO offered a traditional blessing in both Ojibwe and English. A tobacco ceremony united the culturally diverse attendants in a special honor of the elders book publication. Commentary by grant writer and long time friend, Mimi Trudeau detailed her efforts in acquiring the initial and subsequent National Endowment for the Arts and Wisconsin Arts Board grants to fund the portrait paintings in the early 1980’s. Holy Cow! Press publisher Jim Perlman reflected on the lengthy and most satisfying book publishing journey. Jim gave special memorial tribute for editor and friend John Carr who passed away just prior to the book’s publication. Co-authors Jim Bailey and Thelma Nayquonabe relayed their experiences of writing the elders biographies. Finally Sara touched the listeners with her personal stories of meeting James “Pipe” Mustache in Old Hayward many years ago. The friendships between Pipe and the youth and elders of LCO who visited her painting studio at Tony Wise’s Historyland launched the journey to create the images that became the foundation for the historic book. 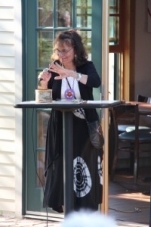 The gathering was quite special for all those in attendance who celebrated the preservation of the people, stories and traditions of the Anishinaabe, the original people of Lac Courte Oreilles. On Monday July 16, a Spirit of the Ojibwe elders portrait showing and book reception was held at the Duluth Art Institute. DAI curator Anne Dugan was most gracious in her hospitality as Sara, publisher Jim Perlman and Ojibwe Elder John Anderson presented their perspectives to the dozens in attendance. The well received reception was centered on a gallery showing of twelve of the original Lac Courte Oreilles Elders paintings that continues until September (http://www.duluthartinstitute.org/current-exhibitions/current-exhibitions ). Following Anne’s gracious introduction, standing next to a slide show of the entire collection of thirty-two paintings, John “Little Bird”Anderson offered a welcoming song accompanied by his hand drum playing. Anderson provided a further introduction of the panelists and later a traditional closing song and story. Of the thirty-two elders portrayed in the Spirit book, Anderson is the sole living elder. Holy Cow! 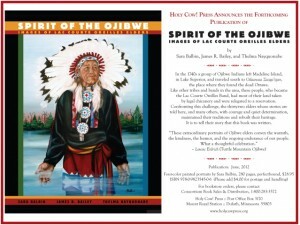 Press publisher Jim Perlman was the next to offer his comments on fifteen year journey to create Spirit of the Ojibwe. His sincerely emotional statement completely captured the audience who were engaged in the story of the books publication. Perlman gave special tribute to Editor John Carr who passed away just prior to the works publication. Sara continued her commentary with the historical background and genesis of the Hall of Elders paintings that led to the Spirit of the Ojibwe book creation. The closing song and dance by Little Bird joined the participants and panelist in celebration of the Spirit of the Ojibwe. Cost is $28.95 plus Wisconsin sales tax where applicable and $4.00 for USPS shipping.